You have to put a little more work into disposal of grease, fats, and oils, but it’s not tough—and it’s definitely worth it. When doing any cooking that will leave a lot of grease behind, keep a container near the sink to pour the grease into. A basic mason jar will do the job, and this is also an ideal way to re-use old coffee tins. If there won’t be a lot of grease, any soup can or other metal can be used. It doesn’t matter if there’s any way to seal the top. Once you’re finished with cooking, pour the grease into the container and then put the container in the trash. If you don’t want the grease spilling out in the trash, place the container into the freezer. The next day, you can deposit this container of solid grease into the trash without worry—neat and clean. You can also poor small amounts of grease directly into the trash if you first put some paper towels into the trash receptacle. The paper towels will absorb the grease and prevent it from dripping out of the trash bag. Make sure you promptly remove the trash bag to the outside once it’s full. If you’re still asking, “Yeah, but why?”, we need to explain why grease should go pretty much anywhere except the drains. Think about what happened to the grease in the freezer. It became solid. Grease doesn’t need to be dropped below freezing to become a solid—the freezer just makes the process faster. All it has to do is cool down to room temperature and it turns solid and waxy. Do you want this sticky residue along the inside of your drainpipes? We’re pretty sure you don’t. Most grease is washed down the drains, but enough will stay behind to start leaving a solid layer along the pipe walls. 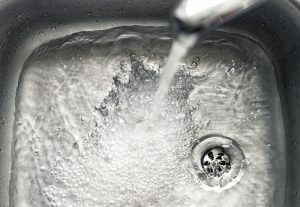 This will continue to build up until you have slow drains or drains that easily clog. At that point, you’ll need professional drain cleaning to get rid of the problem. Grease isn’t good for the municipal plumbing system either! Excess grease can create clogs throughout the local sewer system. Disposing of grease properly is doing your part for a better neighborhood. If you do run into a grease-related drain problem, call a professional plumber in Montpelier, VT. Our plumbers are ready to help! Solve your plumbing problems—call Red Rock Mechanical, LLC. Serving Northwest Vermont and Northeast New York.